Does Air Travel Actually Elevate the Risk of Cancer? It’s true that we are exposed to radiation when we fly. It’s also true that radiation exposure can lead to cancer. But does flying frequently actually increase your risk of cancer? The short answer: Possibly, but likely not by much. The long answer: It’s complicated. While some studies have shown that flight crew and pilots have an increased risk of some cancers, in reality, the research is mixed. We can’t just go around randomly assigning research subjects to different doses of radiation to see what happens, so scientists have to first take a look at who’s already exposed to radiation because of their job or circumstances, then see if that group has higher cancer rates than the rest of the general population. To put it simply, there are a lot of things that can cause cancer and it’s hard to tell whether the reason pilots are more likely to get skin cancer is because they fly a lot or because they vacation more in sunny places without using sunscreen. Similarly, Brenner said, flight crew members and pilots are often more likely to go through routine medical checkups that would catch cancers in the early stages. The groups they’re being compared to might have cancer, too, but not know it, throwing the statistics off a little. Even when scientists control as best they can for these factors, they can end up with an increase in risk so small that statistical analysis can’t show whether it’s real or actually due to chance. Do pilots and flight attendants have a higher risk of getting cancer since they fly so much? Probably not. Image courtesy of Hero Images via Getty. To further complicate matters, cancers that develop as a result of radiation look the same as the ones that develop because of other causes. And the truth is, there’s a lot we are still trying to figure out about why some people develop cancer and others don’t. Cancer is also surprisingly common. The chance that you, personally, will be affected by it depends on a whole range of risk factors, but overall, about half of all US men and a third of US women are at risk for getting some type of cancer at some point in their lives, according to the American Cancer Society. Even so, can flying tip the scales further? Perhaps, said Brenner. But the risk is low. Flying from New York to London, for example, exposes you to less radiation than a single chest x-ray or living in a brick house for a year. Even if you take 50 such flights, that’s still only about as much radiation as you’d get from a standard mammogram. There are a lot of activities we do every day that expose us to radiation, but that doesn’t necessarily mean they’ll give us cancer. Bananas are, in fact, radioactive but that doesn’t mean you should stop eating them. The same can be said of air travel. 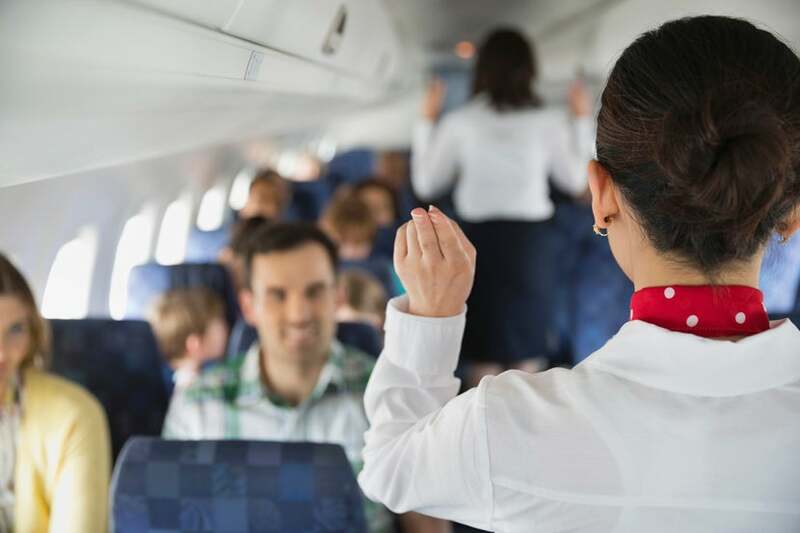 When it comes to cancer, “There are much more important things that people who travel should be thoughtful of than worrying about flying,” said Dr. Erich Sturgis, a head and neck cancer surgeon at the University of Texas MD Anderson Cancer Center in Houston. Things like not smoking, drinking alcohol in moderation, and maintaining a healthy weight through a good diet and exercise. If cancer is a concern, Sturgis said, travelers are likely better off talking to their primary care providers about what standard screening tests they should get for cancers that are relatively common in the general population — depending on your age, that could mean regular mammograms or colonoscopies. It also wouldn’t be a bad idea to do some baggage claim yoga or opt for healthier snacks on your next flight. Oh, and don’t forget the sunscreen. This post is not meant to be medical advice. If you have concerns about your risk for cancer, talk to your healthcare provider. Featured image courtesy of Artur Debat/Getty Images.